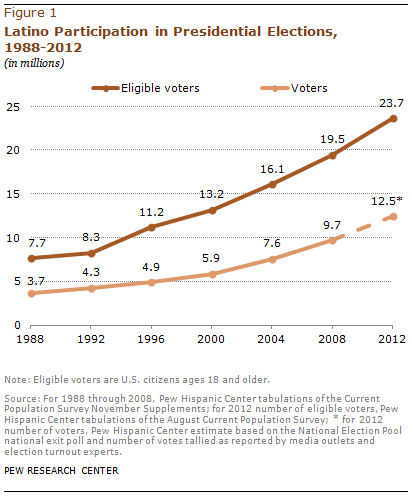 The record number1 of Latinos who cast ballots for president this year are the leading edge of an ascendant ethnic voting bloc that is likely to double in size within a generation, according to a Pew Hispanic Center analysis based on U.S. Census Bureau data, Election Day exit polls and a new nationwide survey of Hispanic immigrants. This report explores the growing size of the Hispanic electorate and the reasons Hispanic immigrants give for naturalizing to become a U.S. citizen—and for not naturalizing. The report uses several data sources. Latino vote shares are based on the National Election Pool national exit poll as reported on November 6, 2012, by CNN’s Election 2012 website. 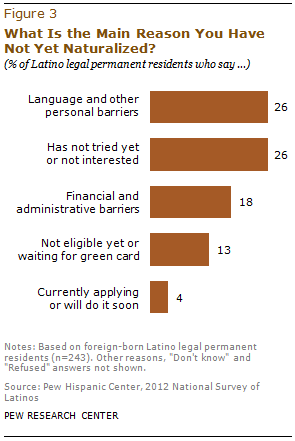 Data on Latino immigrants’ views of naturalization are based on the Pew Hispanic Center’s 2012 National Survey of Latinos (NSL). The NSL survey was conducted from September 7 through October 4, 2012, in all 50 states and the District of Columbia among a randomly selected, nationally representative sample of 1,765 Latino adults, 899 of whom were foreign born. The survey was conducted in both English and Spanish on cellular as well as landline telephones. The margin of error for the full sample is plus or minus 3.2 percentage points. The margin of error for the foreign-born sample is plus or minus 4.4 percentage points. Interviews were conducted for the Pew Hispanic Center by Social Science Research Solutions (SSRS). For data on the legal status of immigrants, Pew Hispanic Center estimates use data mainly from the Current Population Survey (CPS), a monthly survey of about 55,000 households conducted jointly by the U.S. Bureau of Labor Statistics and the Census Bureau. It is best known as the source for monthly unemployment statistics. Each March, the CPS sample size and questionnaire are expanded to produce additional data on the foreign-born population and other topics. 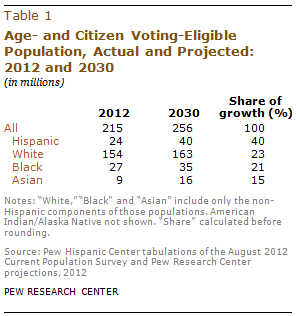 The Pew Hispanic Center estimates make adjustments to the government data to compensate for undercounting of some groups, and therefore its population totals differ somewhat from the ones the government uses. Estimates of the number of immigrants by legal status for any given year are based on a March reference date. For more details, see Passel and Cohn (2010). This report was written by Director Paul Taylor, Research Associate Ana Gonzalez-Barrera, Senior Demographer Jeffrey S. Passel and Associate Director Mark Hugo Lopez. Ana Gonzalez-Barrera took the lead in developing the survey questionnaire’s naturalization section. Passel and D’Vera Cohn provided comments on earlier drafts of the report. The authors also thank Scott Keeter, Leah Christian, Cohn, Richard Fry, Cary Funk, Rakesh Kochhar, Rich Morin, Seth Motel, Kim Parker, Passel, Eileen Patten and Antonio Rodriguez for guidance on the development of the survey instrument. Motel provided excellent research assistance. Fry, Morin and Patten number-checked the report text and topline. Marcia Kramer was the copy editor.